On Tuesday May 1, the AIIA (NSW) held its bi-annual internship presentation evening. 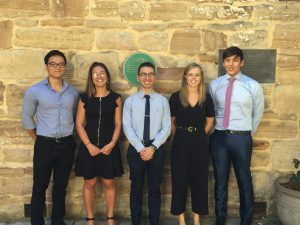 The Institute has been extremely fortunate to have the assistance of five interns and on Tuesday evening each one had the opportunity to make a presentation on any area of their interest. Attendees were treated to exceptional analysis and discussion on issues ranging from human rights to Facebook. Christopher Khatouki presented on “memory politics” and its continuing influence on the relationship between Japan and China. A Second Sino-Japanese War could result from ongoing distrust and animosity, for example over the long-disputed Senkaku/Diaoyu islands. Past memories of significant and traumatic events inform and influence the present, especially where such memories are not reconciled but are the subject of conflicting historical accounts in the two countries. The possibility of conflict has continued to grow as China asserts itself as a major international superpower in conjunction with the increasingly nationalist actions of the Abe government in Japan. Diana Lambert was next with her sobering account on the international community’s consistent failure to directly address and intervene in significant human rights abuses. This indictment is all the more damning when considering the existence of institutional architecture on an international level such as the International Criminal Court, the International Court of Justice and the UN Human Rights Council among others, as well as the commitment of the “Responsibility to Protect”. These were all established to ensure such atrocities never occurred again. Recent failings in Myanmar and Syria have highlighted the perception of such international institutions as being no more than “toothless tigers”. Diana’s presentation raised the importance of further developing mechanisms that strengthen accountability and enforcement to ensure “never again” is not rendered a mere platitude. Michael Nguyen discussed the controversy surrounding Facebook and the recent data breaches with particular concern for its impact on democratic discourse. Michael noted the difficulty that governments have in regulating Facebook despite the need for regulation. Furthermore, governments rely on data from social media companies to engage in their own surveillance activities – a conundrum referred to as “surveillance capitalism”. Though there have been examples of such regulation in Germany and the European Union seeking to address this problem, further actions such as reforming education about the influence of social media on democratic discourse may be needed to prevent an erosion of civil liberties in an effort to legislatively address this problem. Isabella Svinos drew attention to how “human security” has been perceived, especially in a less favourable way post-Libya. Security is often associated with hard power such as military strength and the scope of surveillance. However, with the end of the Cold War there was an increasing focus on addressing security on an individual basis in order to address security issues at their source. Though this understanding of security may be increasingly falling out of favour amongst nations, its importance remains high as security issues become increasingly driven by non-military factors such as the intensification of climate change causing resource shortages and mass human movement. Alexander Tu suggested that China’s rise could pose a threat to liberal democracies, but not in the way one would typically imagine. Communist China’s economic success on the back of its economic liberalisation reforms is frequently cited as “Communism with Chinese characteristics”. This meteoric rise has also forced many to reconsider how China is viewed in relation to the standard liberal democratic lens, especially its supposed totalitarianism. The use and interpretation of opinion polls by the Chinese government to change policy as well as limited voting patterns in relation to Communist Party structures has been described as a “phantom democracy”. Though not giving the same public freedoms as established liberal democracies, the contribution of this “phantom democracy” to China’s continued success may force those liberal democracies to confront existential issues surrounding their system of government.